As another film adaptation of a graphic novel I’ve never heard of, RED is a kitschy caper that tracks a group of retired CIA black-ops agents forced back into action after a hi-tech assassin goes gunning for them. The “plot” – using that term loosely – lurches about with no rhythm or reason. Director Robert Schwentke tries to have it both ways by stuffing his actors’ geriatric antics into a legitimate action movie, but neither half is the least bit convincing…or entertaining. 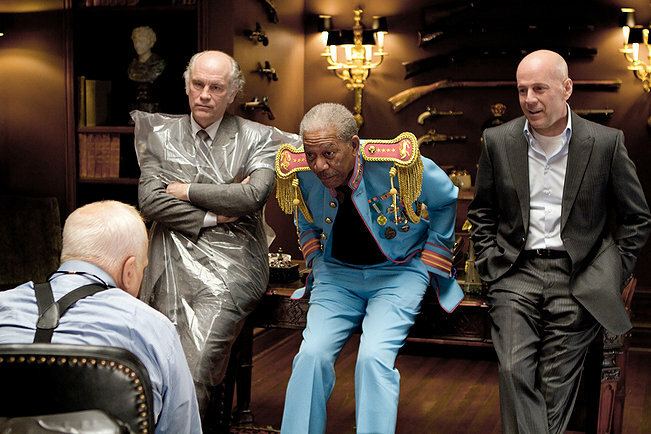 The whole exhibition essentially amounts to a garish vaudeville revue starring past-their-prime performers playing with and against type – “Step right up, folks, and see the amazin’, wacky John Malkovich!” Add to him a laconic Bruce Willis (with a clueless love interest played by Mary-Louise Parker in tow), a doddering Morgan Freeman, Helen Mirren shooting one machine gun after another (though not as many as the movie’s trailer would suggest), and bit parts from Richard Dreyfuss, Brian Cox, and Ernest Borgnine (?! ), and you’re left RED-faced with something akin to a West End production of The Expendables.